I copied this scripture to encourage me about a minor matter prior to my BC diagnosis. 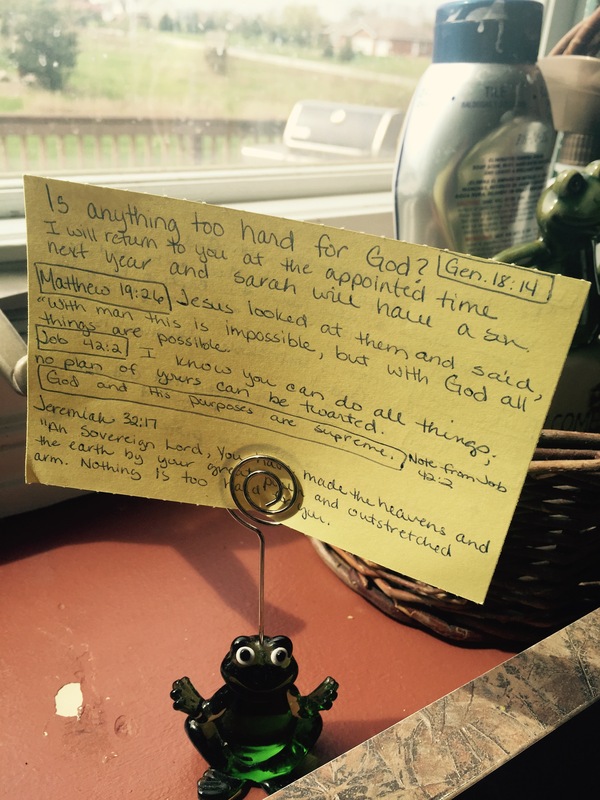 I put it in my kitchen window about a week before….now I’m memorizing it! Just 9 short days ago, I was diagnosed with the “C” word. And, suddenly, my focus has flipped from my normal chaotic and busy life to my new “Breast Cancer Survival” chaotic and busy life. I’ve had three mammograms, one ultrasound of the breast, a biopsy, three phone conversations with a radiologist, general physician and a surgeon, countless Google searches from [Invasive Ductal Carcinoma] to [wigs with human hair], extensive research on various medical facilities and staff near me, several back and forth text conversations with friends and family, one field trip to three different facilities to track down all of my records, one surgeon appointment, lots of prayer and looking up and meditating on scripture, three full days of roller coaster emotions complete with tears one minute and laughs the next, feelings of hope and despair, peace and angst, anger and compassion, nine needle sticks followed by two bruised and sore arms, a genetic test sent off to the lab, one second opinion surgeon appointment scheduled, and waiting as I type this for the radiology department to call me back to schedule my MRI. Cancer is a time sucker! But, the good news (and there’s always good news) is I’ve been able to tell my story at my events and here on my blog and via social media beating the mammo drum screaming at women to have their annual mammogram! I did an event last Sunday. It was a bridal shower and there were just over 70 women there of all ages from 20 something and up. I had all of the women in the room who were over 40 and had breasts STAND. Then I told them to sit down if they’d had a mammo in the last year. About 8 or so women remained standing with one women bobbing up and down not sure if she’d had one or not. I told her she was in the “standing” group. p.s. I ordered a bunch of pink t-shirts today…..gonna have some available soon. They will have my slogan on them: JESUS & a mammo SAVES! and/or MAMMO is AMMO in the fight against breast cancer. I love both sayings! I might just put them both on! I will keep you in my prayers as you win the fight! I will keep you in my prayers Tracy,. In 2014 I was also diagnosed with Introductal carcinoma and it was found by having regular annual mammograms . It was called in situ which means it wasn’t invasive , thank you God! So I didn’t have to have any treatments but chose to have both breasts removed and also tried to have reconstructive surgery at the same time. After four surgeries in one year to try this I finally said enough and then still dealt with an infection for about 3 months after that with daily packing. So, get your dumb mammos women it can save your life…. I need to schedule my mammo. God bless you my friend! Hang in there and fight like our moms did. Take care. Prayers your way! Hi Teresa…I’m doing great and thanks for our prayers and kind words. My surgery is all done and I’m home recovering. Dr said I can’t vacuum for 10 days. Ha! I told Muffin he said 10 weeks! My favorite sound in the whole world is the sound of a distant vacuum. God bless you too Teresa and did you get that mammo scheduled? Hmmmmm? Know what’s weird about breast MRI?